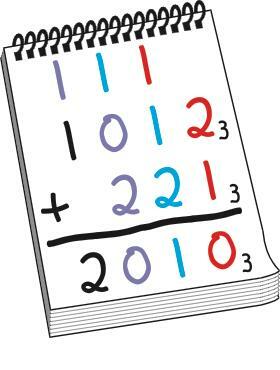 The same as for in Two Land and Three Land. 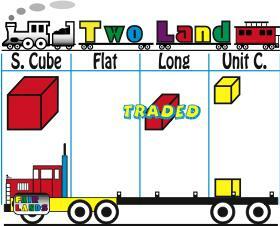 Export (subtract) in Two Land and Three Land with the Fair Lands blocks. Do so in Ten Land and at least one other land with counters. If Ten Land blocks are available, do so with them before doing so with counters. Once elementary school students can “think blocks” and subtract in Two Land and Three Land, they can subtract in any land. All that changes in subtracting in different lands or bases is how many of the next smaller block one gets for a bigger block. 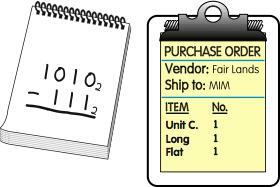 The minuend represents the blocks already in Fair Lands, the subtrahend those on the purchase order to be put on the truck and exported (subtracted) from Fair Lands. Must put a Unit Cube on the truck. 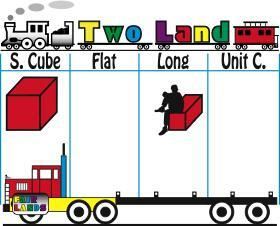 No Unit Cubes, so the Long is traded for two Unit Cubes, one of which is put on the truck. One Super Cube and one Unit Cube are left in Fair Lands.